2016 will be one of the most historic years in politics: It marks the potential for the first female President of the United States, and the 100th anniversary of the first woman elected to Congress. Additionally, in 2016, single women will be one of the most pivotal voting groups heading into the general election, being courted by both Democrats and Republicans. At the centennial of the first woman elected to Congress (which was three years before women legally earned the right to vote), their presence and influence in Washington has reached a tipping point that affects not only the inner workings of the Federal Government, but also directly influences how Americans live and work. Never before have women been represented in such great numbers in the Supreme Court, both chambers of Congress, and in the West Wing. In Broad Influence, Jay Newton-Small, one of the nation's most deeply respected and sourced journalists takes readers through the corridors of Washington D.C., the offices and hallways of Capital Hill and everywhere else conversations and deals are happening to demonstrate how women are reaching across the aisles, coalescing, and affecting lasting change. 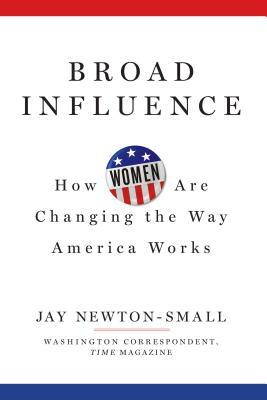 With deep, exclusive and behind-closed-doors reporting and interviews, including conversations with Nancy Pelosi, Barbara Mikulski, Kirsten Gillibrand, Valerie Jarrett, Sarah Palin, Kelly Ayotte, Cathy McMorris Rogers and dozens of other former and current senators, representatives, senior White House staffers, governors and cabinet members, Broad Influence is an insightful look at how women are transforming government, politics, and the workforce, and how they are using that power shift to effect change throughout America. Jay Newton-Small is a political correspondent for TIME, covering Congress, politics and foreign policy, and covered Hillary Clinton's 2008 campaign and her tenure at the State Department. She has focused extensively on women's role in Washington, as evidenced by her Oct. 2013 cover story, Women Are the Only Adults Left in Washington, about the 20 women senators who broke the logjam to get the government restarted and avoid default. She has interviewed every female member of Congress; every living past and present female cabinet member.